Thanks Dr.Smith.. Feels like STEMI but the ST elevation is less than 1mm for tPA to be given. 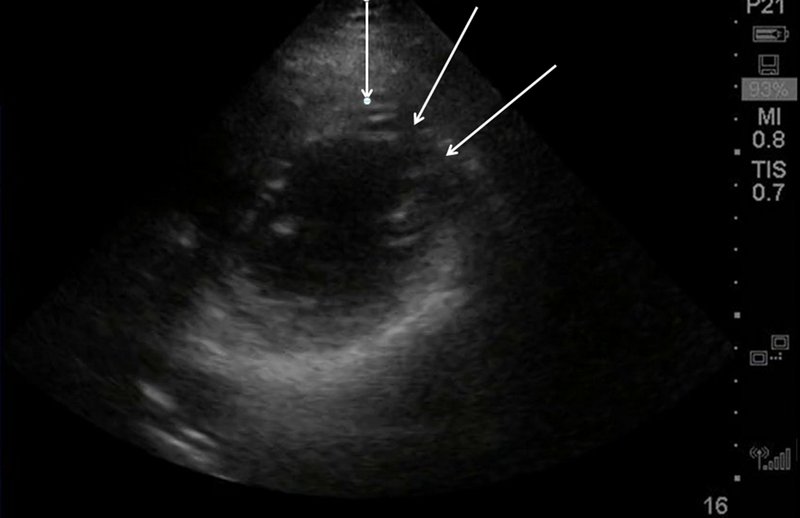 the Echo is very clear regarding the lateral regional wall abnormality. Would that in combination (ECG, ECHO) be a reason to administer tPA if pci not available ? or i would call it NSTEMI? That is an incredibly complex question with no good answer. All depends on risk/benefit. ST elevation is arbitrary and the studies establishing the efficacy of tPA were crude. ST elevation of 1 mm is a very poor criterion for significant coronary occlusion, has poor sensitivity, specificity. Studies generally had mortality as the outcome and even inferior STEMI had little mortality benefit from tPA. For regulatory purposes, this is a NonSTEMI and door to needle and door to ballloon standard measures should not apply. But it really is ischemic ST elevation due to coronary occlusion. tPA, if it works, will potentially save a significant amount of myocardium, but is it worth the risk of intracranial hemorrhage? That is a tough question. The alternative is to give aspirin, a P2Y12 inhibitor, heparin or LMWH, and a GPIIbIIIa inhibitor such as eptifibatide, then transfer to nearest PCI facility. All depends on the risk as well as the benefit. I might give half dose tPA instead of eptifibatide, then transfer. In case 3, what is the likely explanation for the STD in lead III and the flatness in aVF? thank you for again a wonderful case. In case 3, how would you interpret the straight T-waves in the anterior leads. I learned to also look at the morfology of the T waves, and V2V3V4 seem worrisome to me. Any idea's on the sensitivity / specificity of this perticular finding? Yes, at first glance, these are worrisome. however, the QTc was relatively short and the R-wave amplitude is good. If you know of my LAD vs. early repol equation, you can use it to assess whether the ST elevation in V2-V4 is ischemic or not. (see the side bar for the excel applet). I do not have the computerized QTc for this image, but it is quite short, at most about 370ms. The resulting number would be quite low. Where are you writing from? Interesting photo next to your name! Looks like the Alps. And also another point I see is 11mm in aVL, is that also worthnoting? Yes, it is, Martin. Thanks!